Tom was 21 years old when he was shot. A photography student, he had left the UK to volunteer as a ‘human shield’ in Iraq. Here he heard about the ISM, one of whose volunteers, Rachel Corrie, had just been killed by a bulldozer whilst protesting house demolitions in Rafah. He headed there himself, arriving on the 6th April. On the day of his shooting, Tom was with other ISM activists walking through Rafah when Israeli sniper fire started. Almost everyone ran for safety, but Tom noticed that three children, aged between four and seven, had remained motionless, paralysed with fear. Tom went back for them. He got the little boy to safety, and then went back for the two girls. He was wearing a fluorescent vest, and was clearly unarmed. 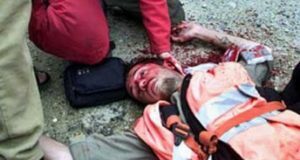 An Israeli sniper shot him in the head. There was a two hour delay at the border of the Gaza Strip before an ambulance was able to take him to a hospital in Be’er Sheva. In a coma, he was transferred to a hospital in the UK, where he died the following year. The soldier who shot him, Taysir Hayb, was convicted of manslaughter and sentenced to eleven and a half years in prison. A British inquest into the killing found that the killing was intentional – in other words, murder. Tom’s shooting followed the murder of Rachel Corrie, run over by a bulldozer on the 16th March, and the near fatal shooting of Brian Avery, shot in the face in Jenin on April 5th. 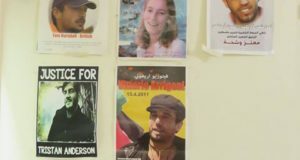 Later that month, another Brit, filmmaker James Miller, was also killed by a sniper in Rafah. The Israeli military have refused to accept any responsibility for what they did to Rachel, Brian or James. Tom, blind to nationalities and borders, exuded humanity. He wanted, he wrote in his journal, “to make a difference”. He did. He also had an outrageous sense of humour and will be missed, most of all, because he made those of us who were his friends smile. He is survived by his parents, sister Sophie, and his brothers Billy and Freddy. – Carl Arindell, The Guardian, 2004. The international community will continue to question the policy and decision makers responsible for Tom’s murder and the murder of thousands of other innocent people.